AMERICAN’s Earthquake Joint System, introduced in 2015, has been put to the test and shown to withstand ground ruptures in excess of those experienced during some of the world’s most catastrophic earthquakes. Test results, published online here, cite AMERICAN’s system was able to withstand at least 21.5 inches of axial extension, enough to resist more than 99 percent of earthquake-induced ground strains measured following four major earthquakes during the Canterbury Earthquake Sequence in Christchurch, New Zealand. To put this into perspective, according to the report, the levels of earthquake-induced ground deformation measured in Christchurch exceed those measured in the 1989 Loma Preita, California, and 1994 Northridge, California, earthquakes, and are comparable to those documented following the 1906 San Francisco earthquake. Water is also essential for sustaining life. “We can exist without power for days, and many have done so, but when our supply of clean water is interrupted, we must restore it soon,” said Maury Gaston, marketing services manager for AMERICAN’s Ductile Iron Pipe Division and author of “Earthquake Resistant Ductile Iron Pipe, Valve, and Hydrant System,” published in Pipelines 2016: Out of Sight, Out of Mind, Not Out of Risk. 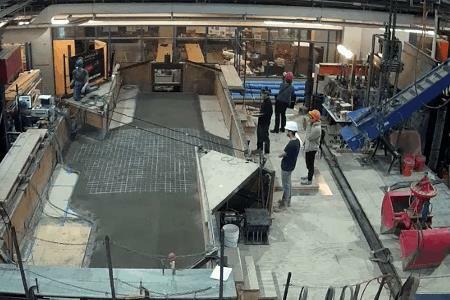 This fast motion video that was taken during the Cornell University study shows the disruption of the ground’s surface under the simulated conditions of an earthquake. AMERICAN’s Earthquake Joint System is buried underneath. A second video shows the test crew unearthing AMERICAN’s Earthquake Joint System to find it passed the test, withstanding the ground forces of the simulated earthquake. A video animation of AMERICAN’s Earthquake Joint System is available on AMERICAN’s website, as well as technical information about the Earthquake Joint System and Earthquake Joint Hydrant Base. AMERICAN Cast Iron Pipe Company was founded in Birmingham, Alabama, in 1905. AMERICAN manufactures ductile iron pipe, spiral-welded steel pipe, fire hydrants and valves for the waterworks industry and electric-resistance-welded steel pipe for the oil and natural gas industries. AMERICAN’s diversified product line also includes static castings and high-performance fire pumps.